With the NHL lockout on the verge of dragging into 2013, one of the events that has been circled on the calendars of starved hockey fans for some time is the upcoming 2013 World Junior Hockey Championship in Ufa, Russia. And while many are excited for a pre-dawn wake up call to support this year’s crop of talented U20’s, the serious hockey fans is also very interested to see how their respective favourite NHL team’s prospects perform on the international stage. For fans of the Ottawa Senators, all eyes will be on Team Sweden this year. About a month ago, it appeared as though there could be a handful of Sens prospects representing various countries at the tournament. But then it was announced that Mike Zibanejad would be spending the holidays in Binghamton, and Stefan Noesen was deemed to be ineligible due to an ongoing OHL suspension. Add to that the fact that other prospects such as Matt Puempel and Cody Ceci weren’t invited to the Canadian camp, and the lone Ottawa prospect in Ufa will be Swedish defenseman Mikael Wikstrand. 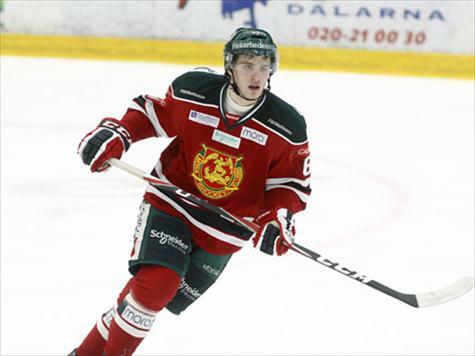 Wikstrand was picked by the Senators in the 7th round of the 2012 NHL Draft, 196th overall. A native of Karlstad, Sweden, Wikstrand was ranked 23rd amongst European skaters in Central Scouting’s final rankings that year. He was drafted out of Mora, a team currently playing in Allsvenskan, the country’s second-tier professional league. A mobile two-way defenseman. Wikstrand plays a pretty simple game and can be used in most situations. Has a quite good shot. Plays with determination and has decent timing when it comes to the physical aspect of the game. Average puck skills. Some interesting offensive abilities. Wikstrand, who likes his name spelled with a “W” despite the passport saying “Vikstrand”, is a decently sized, mobile defenseman that can transport the puck with his skating and easy-solution, crisp passes. As a young player in a men’s league, he would often opt for the simple play, as we’ve seen so many times with other young defensemen. Smart decisions defensively and while he’s not a physical force by no means, doesn’t shy away from contact and is fairly strong on his skates. Through 29 GP with Mora this season (a team that has featured locked out NHL’ers Anze Kopitar and Bobby Ryan), Wikstrand has posted an incredibly impressive line of 9 goals and 9 assists, already eclipsing his highest yearly point total at any level and ranking him 3rd among all D-men. It’s quite a feat for a player of his ilk and age; by comparison, Wikstrand played 47 games for Mora in 2011-12 (his first full season in Allsvenksan), in which he scored a total of 1 goal and 3 assists. Internationally speaking, Wikstrand represented Sweden in the 2011 U18 World Junior Championship, where he (along with Zibanejad) won a silver medal. He was not part of the gold medal winning U20 squad of a year ago, and will no doubt be looking to make a mark as the team attempts to defend its title in Ufa, especially in light of the absence of both Oscar Klefbom (Edmonton) and Jonas Brodin (Minnesota) on the blue line, both of whom will miss the tournament due to injury. By all accounts, Sweden will be hard pressed to repeats as champions, much less even win a medal. However far they go, Senators fans will want to check them out to see if the team has once again found a late-round Swedish diamond in the rough. Wikstrand on Sweden's top powerplay unit. As somewhat of a preview, here’s a glimpse at his game and what may have caught the eye of Sens brass heading into the 2012 Draft. Enjoy the WJHC, and I sincerely hope to be writing about some actual Sens hockey in the new year!